Our friendly crew is mostly from Latvia, Russia and Ukraine that is build on trust and friendship. Our Mission. Baltic Mover Inc. is determined to set the highest moving standards every day for ourselves as well as for all the moving companies by proving highest quality of work. Transfer our big experience, our great work ethics to benefit towards our own company and our customers. Also to leave a very positive and highly professional impression on our customers. To ease a moving process for our customers as much as possible We provide the best quality service and take very good care of our customers for very reasonable prices. Since the day one we don’t have any complaining customers. Also we are available 7 days a week and even during the late hours or Holidays. We believe in quality over quantity. We believe in hard work and dedication. We believe that customer is always our priority, no matter what. Movers Daytona Beach represents one of the best and oldest moving companies in the country...ALLIED. Our rep, Steve, will take great care of you. He can get you an estimate over the phone with help from your mobile device...and can arrange everything from a short move across the State to the big move across the country. Customer service and quality is key, and we provide both....call Steve TODAY!! Whether you are moving only one item or your entire household, we have the experience, equipment, and professional staff to handle all of your moving needs. We can move you 365 days a year, 24 hours a day, even at night or on a holiday. Our men are trained, qualified, and capable of performing any move under any circumstance. If your move requires special handling, we will let you know in advance. Our team will follow your move from the moment you first contact us for an estimate to the moment the move is completed to your satisfaction. WHAT MAKES US A DIFFERENT KIND OF MOVING COMPANY? 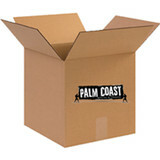 Palm Coast Moving & Storage only employ the most highly trained movers are the best in the industry Our proprietary moving and packing process eliminates stress for our clients Over two decades of moving experience to draw upon Offices in Palm Coast Florida - Yes, a real physical location with our storage warehouse on premises! Our satisfied clients return and refer the majority of our moving and storage business We've received awards for our ethical, professional practices Dedication to the community and the environment Extensive experience in crating and transportation of fine art and antiques 100% satisfaction guarantee on all moves Palm Coast Moving & Storage is the only professional mover with a physical location and warehouse in Palm Coast Florida. We are an award winning moving company with over 20 years of experience offering the highest quality moving, storage facilities, and packing for moving. "AAA Insta-Move Orlando - the right moving professionals in Orlando for you Moving is a challenging thing. This is the period in your life that is characterized by stress, so you need to find something to help you fight it. Look no further, as AAA Insta-Move Orlando reports for duty! We are movers Orlando based, who have all the necessary tools for relocating you quickly, efficiently, and affordably. Our years of experience in the moving industry serve as a testament to our professionalism, which truly is at a high level. Now if you are wondering what would make us the right moving professionals in Orlando for you, let us walk you through the moving experience we provide. All of our clients get to speak with professional and friendly staff members, who will be the first ones to answer your call. In case you request an in-house price estimate, we will send a relocation agent to your home. Once you get your free and affordable moving quote, we can start creating a moving plan tailored to your needs. With AAA Insta-Move Orlando, that is what you get - a relocation experience adjusted to your unique situation. Besides, whatever your situation may be, you can rest assured that our movers Orlando will be more than capable to relocate you. After all, we have thousands and thousands of moves behind us, all more successful than the previous one. Call us today, and schedule your moving date with AAA Insta-Move Orlando! " D.C. Moore & Son, Inc.
Family Owned & Operated Since 1949 Have you been searching for a high-quality moving company to relocate your belongings to your new home or office space? For more than 50 years, D.C. Moore & Son, Inc. has been moving customers' property. 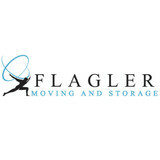 We have been recognized as Central Florida's most recommended movers, handling local and long-distance moves since 1949. We take great pride in our work, knowing that you place a high value on your belongings. We are glad to offer all our customers free estimates for relocating property for their home or office space. Additionally, we specialize in moving, storing, and refinishing pianos. Family Movers Express LLC is a professional moving company based in Orlando, FL, fully equipped to handle your local or long distance move! 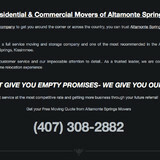 We provide a variety of moving services to residential and commercial customers in the Orlando-Daytona-Melbourne area. Orlando Moving Company is here to serve you. With more than 28 years of knowledge in the moving industry we are committed to high quality service, and a great moving experience from beginning to end. At ShedMovers we buy, sell, trade and move sheds! Nobody does it better! We're the Only Full Service Shed Dealer in Central Florida! ShedMovers is your 21st Century Shed Dealer! The only dealer confident enough to offer you a 100% SATISFACTION GUARANTEE AND a LIFETIME INSTALLATION WARRANTY. Ask anyone else, anywhere to MATCH THAT! Wind Load to 175 mph & many more advantages, like a 3 year 100% Warranty - 30 year Warranty against rust or corrosion -- lots more!) You can afford the very best! If distance is a problem or if for some reason you can't make it here to view our shed models, we'll make it to you! Just give a call and we'll arrange to have one of our shed experts stop by! We make it easy and convenient to buy the very best products and service. We’ve Got Your Back The heavy lifting associated with moving can easily lead to pulled muscles and/or a strained back. Our team of professionals will save you from any injuries associated with loading and unloading your moving truck. Experienced and Professional We have years of moving experience and can handle any size job. We know how to carefully move your belongings without damaging them, or your house. We carefully plan each job, and make sure our clients are always satisfied. Friendly and Helpful Not only are we experienced and professional, we are also a pleasure to work with. We keep a great attitude about what we do and we are here to help make your move a smooth one! Insured We are fully insured. Both our movers and our vehicles are covered with full insurance. Reputation Over the years we have built our reputation as a trustworthy and high quality moving company. From day one we knew satisfied clients would be the key to our success, and we never lose sight of this goal. We are your first professional choice for your up-coming move. We are family owned and operated, licensed and insured, specializing in The Villages area in Florida, and providing our services to the entire state of Florida. We are a completely "Hands Free" moving company. Our highly experienced movers can do everything for you, worry free. Assembly and disassembly of your furniture, appliances, boxing, packaging, loading and unloading....we will take care of you, completely. Relocating to a new house is stressful enough without having to worry about the logistics of an entire move. So when it comes to the heavy-lifting (literally), leave it to the professionals — professional movers, that is. Experienced Ormond Beach, FL moving companies consist of expert movers and packers who can efficiently pack, move and assemble your Ormond Beach belongings to ensure that you get off to a good start in your new home!